The rear seat is split for folding. Each part of the rear bench seat can be folded down to increase the size of the luggage compartment. Push the head restraint all the way down . Pull the release button forwards and fold the backrest forwards at the same time. The rear seat backrest is unlocked when you can see the red marking on button . Passengers (adults and children) must not use seats if the backrest is folded forwards. Fold back the rear backrest and push it firmly into the lock until it clicks securely into place . The red marking on release button should no longer be visible. The rear seat backrest must always be securely engaged. Injuries can be caused if the rear backrests are folded forwards and backwards carelessly. Never fold the rear seat backrest forwards or backwards while the vehicle is in motion. Ensure that the seat belt is not trapped or damaged when folding back the rear seat backrest. Always keep hands, fingers, feet or other body parts away from the seat area when folding the rear seat backrest forwards and backwards. Ensure that the rear seat backrest engages securely, otherwise the seat belts for the rear seats will not work properly. This applies to the centre seat of the rear bench seat in particular. If a seat is occupied and the backrest has not clicked securely into place, the seat occupant and rear seat backrest may move forwards in the event of a sudden braking or driving manoeuvre or during accidents. The backrest has not been secured properly if you can see the red marking on button . Always ensure that the red marking is never visible when the rear seat backrest is in the upright position. Passengers (adults and children) must not use seats if the backrest is folded forwards or is not clicked securely into place. 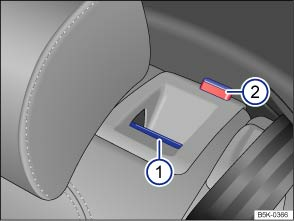 Before folding the rear seat backrests forwards, adjust the front seats so that the rear head restraints or rear seat cushions do not rub against the front seats.